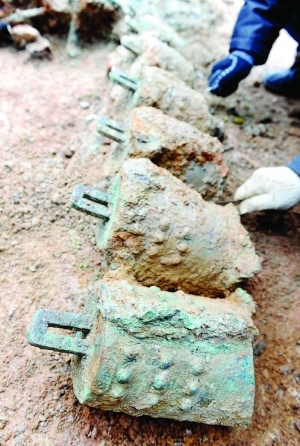 Archaeologists in east China's Jiangsu province said they have excavated a bronze chime and several other artifacts from a tomb dating back to the Warring States Period (475-221 BC). The chime was discovered in a tomb located under a construction site in the city of Suqian. 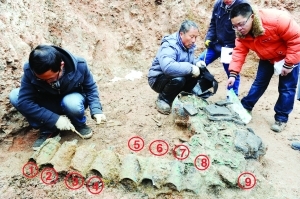 Although the tomb had been previously raided by looters, researchers still discovered a number of bronzeware and earthenware artifacts, including bronze tripods and ceramic chimes, according to Li Gengshan, head of the city's Sucheng District Museum. Although the owner of the tomb remains a mystery, the value of the artifacts suggests the owner may have been a high-ranking official or aristocrat, Li said. Ancient Chinese aristocrats used chimes in musical performances as early as the Western Zhou Dynasty (1046-771 BC). A 10-tonne chime excavated from the tomb of Duke Zeng in central China's Hubei province holds the record for the largest chime discovered in China.